It is a very special week because as long as I pass one of my remaining two practice lessons I will be awarded a CELTA!! Oh... and is it your blogiversary? I believe this week will be special because during the course of its existence it will be the only week that, in fact, exists. 80s games! i have a chance! the big week: something to do with college football? the reading list? Well, i don't know for you... For me this week is special because i am suposed to go back to work. Have yet to start, hehe. 1. 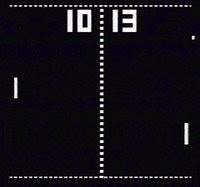 Pong, was Blip something else altogether? I played this! 2. Space Invaders? I played this, too! 3. shoot the ugly bad guys. Not For Me. But when we made holiday baskets for those in need - they had both Atari & cable... Go figure. Unofficial question - Birthday week? oh! the special week: does it have anything to do with your decreasing caffeine consumption? 2 is that Space Invaders? Gosh, it looks so. . . primitive. . .
4 looks a little familiar. . . maybe Civilization? (the early years) though I think it's really another one I can't remember. . . It's a very special week because your lovely wife ordered you Spore for your birthday and it's on its way! She'll probably have to entertain herself for a few months. 2. Defender. I hated this one. Too damned many buttons. the rest are past my time of videogame playing (we had Intellivision not Atari anyway), and before the times I was forced to watch others play, but I think 4 is probably Civilization. I don't think this is that special of a week, but you tell me and I'll celebrate. 2. Was it called Gallaga? 3. Yikes! Nothing I ever played. I don't actually play these games, but the computer geeks I live with do. And this is a special week for you, Michael, for the same reason it is for Morgan -- SPORE is being delivered to your house. I have played number three and it really pisses me of that I don't f*&$ing know it. I have no clue except the last one might be Kings Quest maybe I don't know. When is the quiz on British Soap Operas? @rebel: i know; i was just waving from this side of the planet. :) i have no doubt you'll pass your lessons! also, i'm really waffling on my answer: #3 could be doom, too. 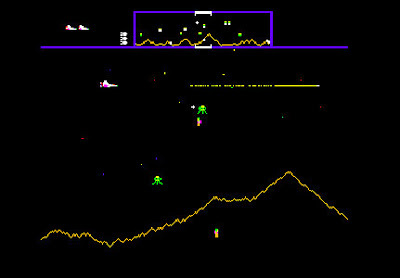 2. not Space Invaders because of that terrain, so Defender or something like that. Never played it but have seen it. 3. Reminds me of Doom but that's not it. Not sure. 4. No idea. Looks like fun though. 5. 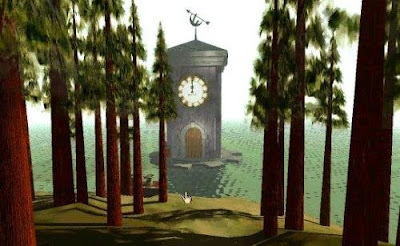 Myst. Never played that either but have seen many screen captures and it can be a pretty one. I think Second Life stole the vibe. 4. Really not sure on this one... Civilization? Is there even such a title? I'm going to guess that this week is very special because the long-anticipated game Spore is out and you will be getting your copy. 1. Bong. I mean Pong. 2. Defender. An old favorite. 4. Christina's World. I love it when you refer back to previous quizzes. 2. Defender. The only arcade game I was ever any good at. 3. Doom. 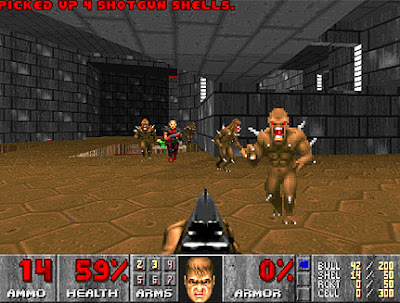 The breakout "First-Person Shooter." Not my particular cup of Night Train, but a very influential game. 4. The magnificent Civilization I. I saw it, and my life was never quite the same again. Really. Three Exclamation Points going out tonight to people well-versed in their gaming history. Chance is two EPs out of first and a single EP out of second on the leaderboard, taking his fourteenth MQ win. Ben snags the second Exclamation Point for his trophy case. and Melissa, the Indigo Mouse herself, grabs her first ever piece of L&TM5k bling, becoming the 54th person to take home an MQ EP. Also -- and I understand that the following statement could be construed as, you know, sexist -- she's a woman! Who just aced a quiz about computer games! So she's clearly awesome. @Karma: "John Madden's All-Pro Football" gave me my first good laugh of the day. @gl. : Castle Wolfenstein 3D had a very similar look. So close. Head start? Timing doesn't count in the Monday Quiz. It's all spelled out in the unnecessarily complicated rules! @Rebel: Congratulations on getting lucky! Wait, what? @Mrs.5000: "that classic shooter...Nasty Alien Kill Kill" is basically correct. And I love it when you say things like "that classic shooter." But I needed a name. 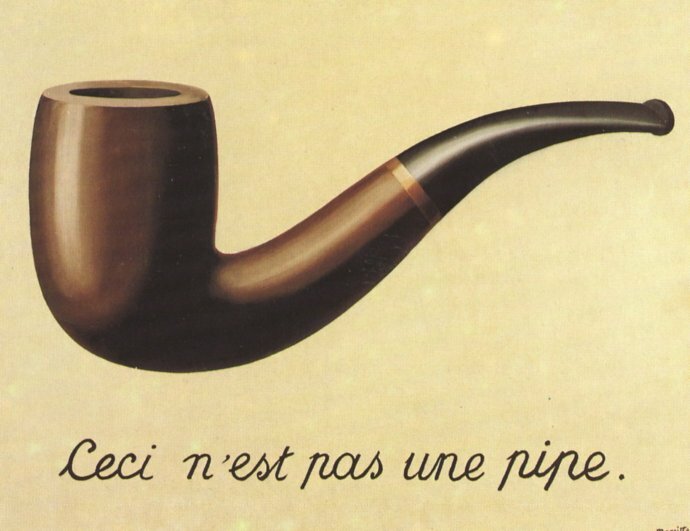 @DrSchnell: "Ultima"? "ULTIMA"?!? Are you baiting me?!? @Todd: I said it before, and I'll say it again: Castle Wolfenstein 3D had a very similar look. So close. @Kate: "Sim Farm"? OK, I actually don't think you are baiting me. @Elizabeth: We'll be back. Eventually. Promise. @gl. : Oooh... with the waffles, I have to go with the first choice, I'm afraid. It must be. @Ben: OK, I'm pretty damn sure that you are baiting me. @mhwitt: "Wizardly Silviculture" gave me my last big laugh of the day. It's Spore Week, suckers! Happy gaming! "Oooh... with the waffles, I have to go with the first choice, I'm afraid. It must be." Not really on the baiting thing... but it didn't look like Civilization as I remembered playing it. 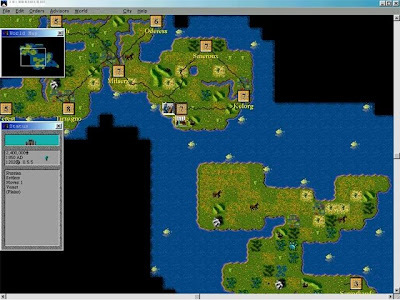 But I just realized that I never played the original Civilization, but rather Civilization II, which looked a bit more graphically advanced. So I fished back in the ol' braintubes and came up with.... Ultima. Actually, I did play the original Civilization, the old Avalon Hill board game that clearly "inspired" Sid Myers.